I’m sure this is a great park in the summer. During wintertime (I’m guessing this would be the period of October – March), the park has reduced services. During winter, no one is available in the office; you must self register. During that time, you must pay with cash or check only. Also, there is a posted sign specifying that you must pay cash to get the Good Sam discount. I’m not sure if this is enforced during the spring and summer, when credit cards are accepted. When I pulled in, I went directly to the window and self registered. Then I went back and tried to connect. First of all, the park does not have cable TV. This was a surprise to me, for a park of this size. Over the antenna, you will basically get the networks. Second, I had problems connecting to the pole (options were either 50 amp service or 20 amp service; if you have a 30 amp connector, you will need a 30/50 adaptor). I tried connecting to the 50 amp, I could not get it to work. Then, I tried connecting to the 20 amp, and discovered the plug in had been installed upside down. This created problems because the cord was “bent back” when I closed the cover to the electrical connections. So, I fiddled with the 50 amp again, and I finally got a connection. I had to turn it off and on many times to “reset” it. Lesson learned: “Don’t ‘self register’ until you are assured that your connections are functional!” I thought of changing sites, but figured it would cause a problem at that point. If you use this park during the winter months, it’s good only for an overnight. There are so many rules and the person that patrols the place in her golf cart is horrible. We had two friends come visit during the day, and two hours later we were told to leave because we had violated the no visitor rule. She sat at the gate and would not let people even come visit their family members. She even called the police after she informed us we had to leave. We gladly packed up and left. I would highly recommend never staying here unless you plan to not leave your camper! Full hook-ups apparently mean something different at this campground, as there is no cable and spotty Internet at best. There is no place to walk your dog, accept for a little patch of enclosed gravel. If you like the freeway, this is the place to be because you are backed up right into it. There’s lots of highway noise. And fiber optics? Not here. Anyhoo, I would not recommend this campground. Lots of un-monitored kids and dogs leeping out atcha is what you will find here. Thanks for the report Bill! Sounds like a great place. Wow! a campground that actually enforces the rules. My kids shouldn’t be riding down the slide on their knees and I’d want someone to make sure they don’t. I also don’t want alcohol anywhere near the pool. A big thank you to Suncrest Resort for enforcing the rules. Inconsiderate campers shouldn’t spoil it for the rest of us. Your report probably convinced more campers to stay at Suncrest! We stay at Suncrest this past weekend. At first glance, it was clean and organized. Everything was groomed and watered, then I noticed the signs. I mean there are literally 14 separate signs in the pool area. Rules, rules, and rules, everywhere. The guy we called “the gestapo” patrolled the pool, no one was off limits. He asked to taste drinks to make sure there was no alcohol. He hollereed at some 4 year olds for riding the kiddie slide on their knees. We will never go back. This place did not make “our type” feel welcome. Our type being families. I stayed here August 15, with plans of staying on the 16th. We were part of an event in the Grant County fair, a place opened up there for us so we could have our dogs in the trailer with the AC on as it was 107 degrees that day. At 11:30 am on the 16th I let them know that we would be leaving. Since we had already paid for the 16th, I lost my money for that day, but didn’t argue with them. Just be prepared to not get a refund for ANY reason if something should change for you. 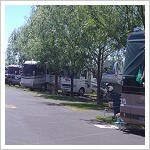 Also we had issues with the power as stated in a post by JJandCP, and if you have a large RV and the park is full, you may have to ask neighbors to move so you can back in. Make sure you read the entire web site so you have no surprises. The attitude posted by pj is confirmed. But they did give me $3.00 in ice to help compensate for the cost of the night that I would not be staying.